We can imbue talismans with tremendous power through the powers of faith and suggestion. If you believe something will work for you; it often will. Monica Outlander of MiaMai has created in real life and now in Second Life®, a collection of talismanic sprites that can bring health and happiness to those who invest the power of belief in them. If your worldview is more prosaic and devoid of supernatural beliefs, they can also be enjoyed for their quirky adorability and the come with a magnificent free shelf that can be used to display these sprites, but I think I will also rez a few more of these shelves for otters things as well. There’s also a home protection sprite hanging on a branch that is equally adorable. The gorgeous house is the Hudson Townhouse from Scarlet Creative and can be found at Collabor88 this month. Afternoon everyone, I am snowed in so I thought I would play around with a few bits I picked up wandering around looking at sci-fi fantasy stuff. I also wanted to get this up before the end of Futurewave 2015, so you have a chance still to get the goodies. I think the end result is a nice sultry mix of futuristic fantasy genre. I don't have any deep thoughts or stories to accompany this post. I think I will let the images speak for themselves. All the juicy details on where to find the items I am wearing, what you get when you buy it and what I think of the items are below as always. These pretty flowing locks called No Tears are the most recent free hair gift from No Match. It comes with a regular size and larger size for those who have hefty chests. It comes with a color change hud with five cute colors. There seems to be so much I want to blog and so little time to do it all in. Today I have some more items from the Fantasy Gacha Carnival. Not all birds are meant to fly, and neither was I until I got some balloons to help me out. Of course as the saying goes "What goes up must come down", well that applies to me as much as an apple. Luckily my flight took me over water so my landing was a bit wet but otherwise I was fortunatly unscathed. Going Bust is upon us once again! The Challenge Travels the World! I love this Natura jacket from ::K:: by Kitt Ragu (pet peeve: creators, please give your brand a real name. K or @#$%^ or other ultra short, or full of special characters, names are very hard to find in search!!! I thought this was one of those abbreviations people do in their items when they box them … but this shop is actually called K. It confuses me, people… don’t do that to me!! Anyway, the jacket (with shirt under it) is adorable and availabe both for women and men! I am wearing it with PIxicat‘s Klara jeans and Aphorism‘s leather ankle boots. They look like nubuck or suede to me though. Hence the title of this post! I am being lazy on Cheeky Pea‘s Nile bench which needs to be on your porch, really! My hair is Birdy, by Lamb, and my skin Alice by Glam Affair. 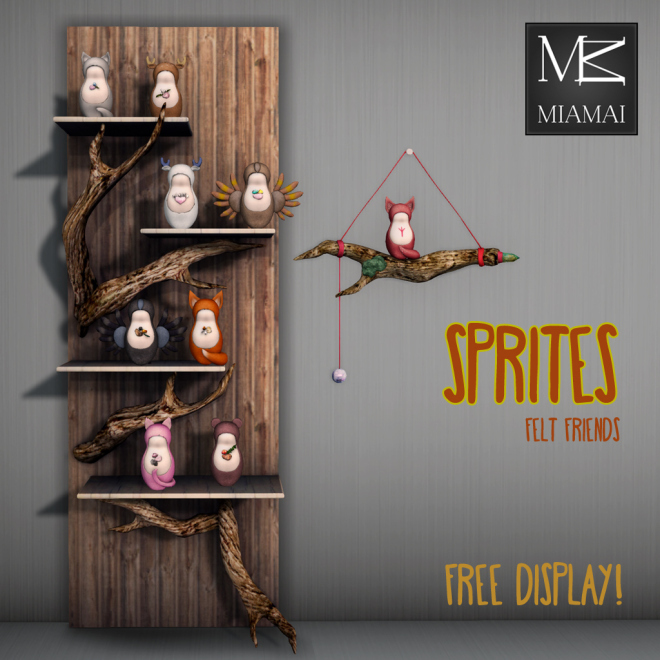 Originally posted on MIAMAI :: Fashion House: I am happy to introduce you to my little friends, the Sprites!